The Minimum bid is $175! *Please note: I will not be available at the time the auction closes but will attempt to lock the auction thread while on the road. I will perform the end auction activities once back. 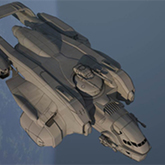 Congratulations to mohoc for winning the Limited edition MISC Starfarer Tanker LTI for $350! That is an amazing $175 more raised for our Org!